In advance of PTC’18, Ciena’s Brian Lavallée sat down with Jean-Sébastien Tassé of EXFO to discuss the importance and intricacies of properly measuring OSNR across submarine cable networks. One of the key performance indicators of the health of high-speed optical submarine networks is known as the Optical Signal-to-Noise Ratio (OSNR). I sat down with Jean-Sébastien from EXFO and discussed this critical measurement parameter to understand why it’s so important to submarine cable operators in maintaining the performance of their submerged assets. Let’s dive into the (technology) deep end. Jean-Sébastien Tassé has more than 13 years of experience in Sales and Marketing and currently holds the position of Product Line Manager in EXFO’s optical business unit where he oversees the business strategy, roadmap, and launch strategy of the optical spectrum analyzer and dispersion product lines. Brian: Why is OSNR important to submarine network operators? Jean-Sébastien: To address ever-increasing bandwidth requirements, 100G is now the cornerstone of most submarine network deployments, with even higher rates on the horizon, or on some submarine cables, already there. OSNR has long been recognized as a key performance indicator for amplified high-speed submarine networks to ensure network performance and reliability. I’d like to discuss the benefits of OSNR testing, different methods for different signal types, and provide an update on the latest standards. We’ll also talk about how OSNR becomes even more critical as rates increase beyond 100G. Brian: What are the benefits of OSNR testing? Each 100G or higher (100G+) coherent submarine cable features a minimum OSNR value that must be met at the receiver to ensure error-free transmission. Regularly measuring OSNR can help service providers and system vendors assess how much OSNR margin (headroom) is available to proactively address any performance issues before a network outage actually occurs. Network failures can occur for a number of reasons and OSNR testing allows for quickly pinpointing and addressing any defective ROADM or repeater. Increasingly, existing coherent 100G links based on the QPSK modulation format are being upgraded to higher rates, where possible, using a variety of new and ingenious modulation formats. While 100G QPSK signals work fine with just 13dB to 15 dB of OSNR at the receiver, 16-QAM signals, for example, require 18dB to 20 dB OSNR, which is a much more stringent threshold. Practically speaking, a submarine cable supporting 100G QPSK transmission today may or may not be upgradable to higher modulation rates due to OSNR limitations, among other cable-related impediments. Brian: Are there different OSNR measurement methods for different signal types? Jean-Sébastien: Yes. The traditional method to measure OSNR is defined in the IEC 61280-2-9 standard and is known as the interpolation or out-of-band method, as shown in Figure 1. This method consists of measuring the noise level at the mid-points between the channel of interest and its two adjacent neighbors, N(λi - Δλ) and N(λi + Δλ) , and then calculating the average of the two noise values to obtain Ni (see Figure 1), thus performing a linear interpolation. 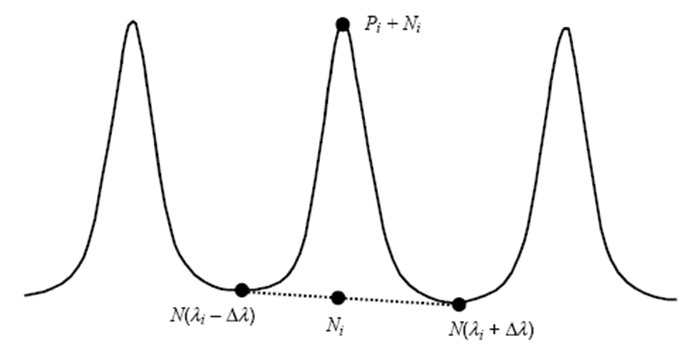 The OSNR can then be calculated by dividing the signal power by this interpolated noise value, after normalization. This method works well for networks up to 10G, without any Reconfigurable Optical Add-Drop Multiplexers (ROADM). However, IEC 61280-2-9 isn’t feasible for 100G+ signals as well as ROADM networks. Figure 2 illustrates 100G channels spaced 50GHz apart, which is a common spacing in modern submarine (and terrestrial) networks. Polarization-Multiplexed (Pol-Mux) 100G+ signals are typically wider (require more optical spectrum) than legacy On-Off-Keyed (OOK) 10G signals, meaning they could overlap with neighboring channels. Accordingly, the midpoint between channels no longer consists only of noise, but rather of signal plus noise. 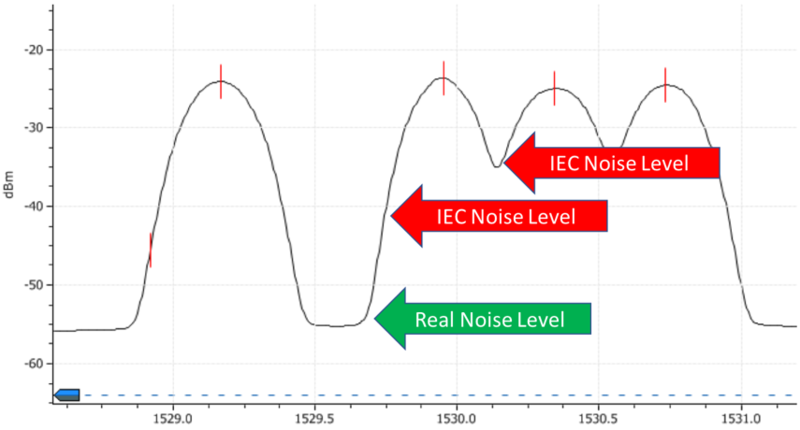 Thus, the IEC method applied to 100G+ Pol-Mux signals will therefore lead to an overestimation of noise and inaccurate measurement date leading to incorrect decisions. Figure 3 illustrates a 100G signal that has gone through a ROADM, with the green area showing the channel bandwidth. Given filters inside a ROADM, the noise at the midpoint between channels will be carved (or filtered), leading to an underestimation of the noise level, if the IEC 61280-2-9 method is used, meaning this method is not feasible in ROADM-enabled coherent submarine networks. To address the issues described in Figures 2 and 3, in-band OSNR was introduced around 2009 to support OSNR measurements of 10G signals in ROADM networks and 40G OOK signals. However, this method can’t be applied to coherent, Pol-Mux 100G+ signals, because of technical reasons beyond the scope of this blog. Consequently, Pol-Mux OSNR techniques have been introduced to support 100G+ signals, which is the topic of the latest standards. Brian: What are the appropriate standards for Pol-Mux OSNR measurements? 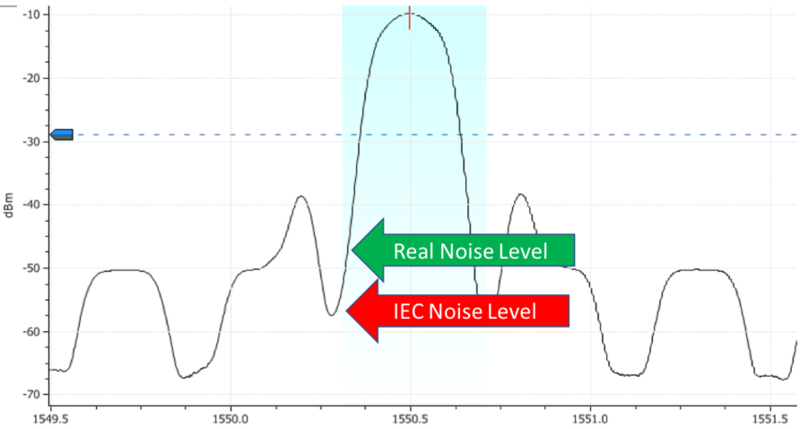 The only drawback of these two standards is that a careful application of their formulae requires turning off channels, to access the Amplified Spontaneous Emission (ASE) noise floor, which isn’t possible on an in-service lest we upset end-users! Fortunately, in-service Pol-Mux OSNR methods have been introduced. Table 1 summarizes the correct OSNR method for each type of signal. Simply put, using the wrong OSNR measurement method for a given signal can have a significant impact on results, as it can lead to errors ranging from a few dBs up to 10dB, potentially leading to future outages. Using the proper method guarantees the right OSNR measurements are achieved leading to accurate network modeling, link simulation, and maintenance of ongoing submarine cable network performance. Brian: How would you summarize the importance of OSNR and its proper measurement method? Jean-Sébastien: I highlighted some of the benefits of OSNR testing, including avoiding network outages, optimizing troubleshooting times, and ensuring optimal submarine cable performance. I believe OSNR will become even more critical at data rates beyond 100G, because of the more stringent OSNR thresholds that will be required. Several OSNR methods have been introduced over the years, so the key takeaway is that the right OSNR measurement method must be used on a specific signal type to get accurate results. Want to find our more? Visit Ciena and EXFO at PTC 2018 running from January 21 to 24, 2018.